We all have that room in our house... you know, the one that’s a catch-all for everything. Maybe it’s also a craft space or a partial office, and maybe you try to squeeze Aunt Betty in there, too, when she comes to visit. Dual-purpose rooms can be a challenge to make work in multiple ways. But, knowing how to design a multi-purpose guest room will give you a versatile space to suit all of your changing needs. Let’s look at some creative guest room solutions that will make your space work for both you and your visitors. When trying to carve more than one function out of a room, it may work well to find a way to separate the spaces. A low piece of furniture and a well-placed rug can separate the office area from the guest room area. You can also use a mid-room curtain to divide the two spaces. Consider placing artwork on a feature wall to separate a guest or gathering space from an office area. And back-to-back bookcases can offer optimal visual interruption and provide a true separation of the spaces. Designer Tip: A table with two drop leaves can serve as an eclectic divider between spaces in a dual-purpose guest room, as well as provide display space for a few décor items. When it comes to doubling up on space usage, you’ll need to get creative with your storage solutions. Decluttering is your top priority. Think ample shelving, baskets, storage boxes that slide under beds, additional closet shelving, and cabinets that hide any extra supplies. Designer Tip: Divide closet space into two sections: yours and your guests. Always keep a portion of closet space clear for your guests’ convenient use. That way, you won’t be scrambling to re-home your belongings every time you have a visitor. You can also use a corner desk cabinet, which may provide more efficiency than a standard rectangular desk. Trimming down your desk size can also help in a smaller space. Opt for an 18-inch wide desk, rather than the standard 24-inch wide or larger desk. Install ceiling-height curtains to close off your desk area when not in use. Designer Tip: Monday through Friday, you will have a comfortable place to work. Then you can hide it all away on evenings and weekends. Your desk chair doesn’t have to look like a corporate office chair. Ditch the black chair with wheels and opt for a classy, upholstered chair instead. When you’re working, it offers a comfortable place to sit with enough back support. And when you’re not working, it can be used elsewhere in the room as inviting seating for your guests. Designer Tip: Add a small table in between a set of matching or coordinating chairs. Your guests can use this space for reading or talking on the phone. So, you need your room to double as an office space and a guest bedroom? Perhaps it’s a casual entertaining space as well. If you’d like to accommodate your guests with a king- or queen-size bed but don’t have the space, all is not lost. There are many guest room bed options available. When you don’t have quite enough room for a bed, make your bed compact by trying a daybed or a sleeper sofa or pull-out loveseat. If your guest room will be mostly used by kids, go up! Consider getting a set of bunkbeds, which will add more sleeping to your room, but not take up any more of a footprint. A twin-size bed with a trundle is another way to double your sleeping capacity without compromising floor space. These versatile furniture pieces offer a comfy sitting space by day and a convenient place to sleep at night. If you have enough space between the wall, you may want to consider installing a Murphy bed. Murphy beds are available as full beds or DIY kits. Designer Tip: When investing in a daybed of pull-out sofa for your guests, don’t go cheap. Choose a bed that you would want to sleep on. Upgrade to the best mattress possible. Your guests—and their backs—will thank you. If you’re using a room for more than one purpose, then you’ll have twice the items to store in that space. One or two storage ottomans provide out-of-sight storage for blankets, pillows, and other miscellaneous items. Plus, your ottomans can double as seating that can be easily moved to any location in the room. 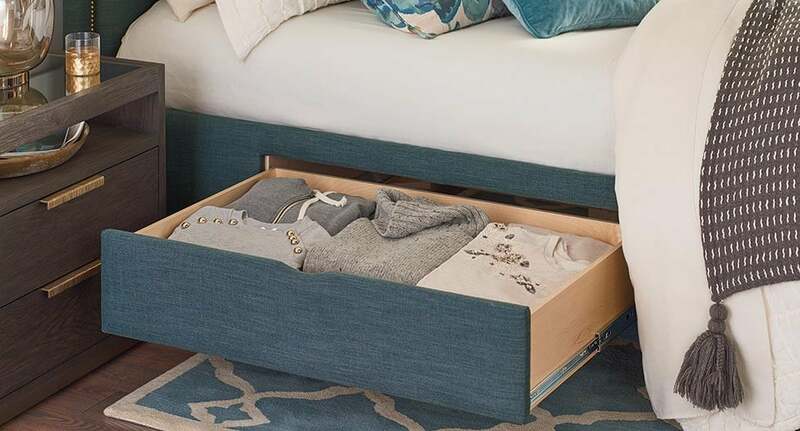 A daybed, bunkbed, or a bed with storage drawers will give you a place to store linens and other guest-related items. Don’t forget a small mirror and a dresser or accent chest for a TV, clothing, and other items as well as a functional bedside table for jewelry, a book or a glass of water at night. Designer Tip: Add a decorative locking cabinet to store valuable or breakable items when children visit. The most important factor is to design a guest room with compassion. What surroundings would you enjoy when staying at someone else’s house? Instead of sending your out-of-town guests to a hotel, invite them into your home. No matter what time of year it is, pillows, blankets, and other cozy accessories add personality and a comfy vibe to any space. Don’t forget to include a television for convenience. Perhaps your guests might enjoy watching the morning news or late-night show without disturbing the rest of the house. Have some fun with your décor so your guests feel at home. Designer Tip: Supply your guests with a handy basket of midnight snacks and provide your Wi-Fi password in a decorative frame. Ready to design your multi-purpose guest room? Call us today for your one-on-one consultation!